The interior of the Yale Center for British Art, in New Haven. But woe not, eager traveler! We found a passport that can take you to a string of museums and historic sites, all a day trip or overnight from Boston, no bank-breaking required. The Connecticut Art Trail is an eclectic network of 21 museums and historic sites scattered throughout the state. You can pick up a $25 passport at any trail site, or order online at ctarttrail.org. The passport scores you one free visit to each museum per year. Start anywhere, end anywhere, opt out of any between. Of course, you don’t need a passport to go any of these museums — in fact, many are free. Explore any during regular hours for regular admission price. But if you do decide to visit them all and get your passport stamped? Aside from the feeling of accomplishment, a completed passport enters you into a contest. This year’s prize, for example, is a stay for two, plus a couple’s massage, at a luxury area hotel; 2019’s prize hasn’t been revealed yet. We can’t fit all 21 stops here, but we’ll highlight a few. Blaze your own trail. 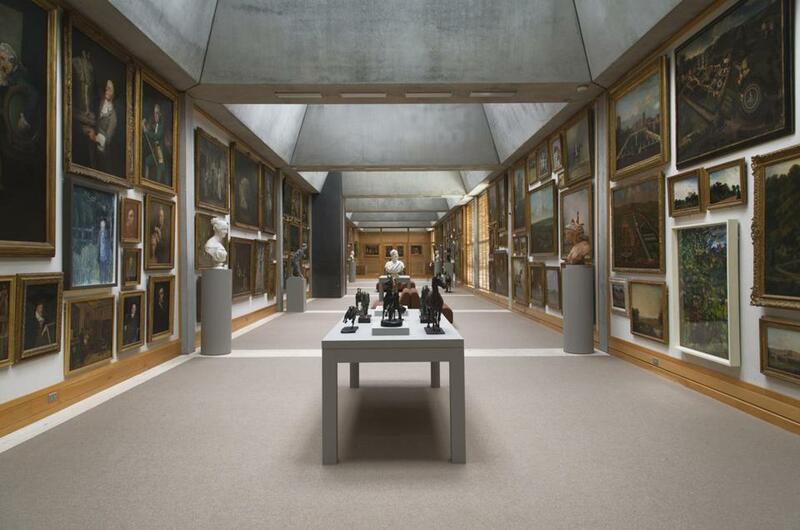 While on campus, explore the Yale Center for British Art, which, according to its website, houses the largest collection of British art outside the UK. Current exhibits include “Captive Bodies: British Prisons, 1750-1900” (Nov. 25) and “George Shaw: A Corner of a Foreign Field (Dec. 30). Free. 1080 Chapel St., New Haven, 203-432-2800. Founded in 1842, The Wadsworth Atheneum Museum of Art is a Hartford gem, housing a mammoth-size collection of some 50,000 works, spanning 5,000 years, in five interconnected buildings, according to its website. Current exhibits include “Monsters & Myths: Surrealism and War in the 1930s and 1940s” (Jan. 13) and “Bed Furnishings in Early America, an Intimate Look” (Jan. 27). Bring your young artists to monthly Second Saturdays (admission free 10 a.m. to 1 p.m.) when they might make their own creations, see music, dance, theater, and the like. Adults $15, under 18 free. 600 Main St., Hartford, 860-278-2670. thewadsworth.org. Fairfield University Art Museum houses a small yet eclectic permanent collection, from ancient to contemporary works. Current exhibitions include “Mizusashi: Japanese Water Jars From the Carol and Jeffrey Horvitz Collection” (through Dec. 14) and “Liberia,” a collection of West African art (Dec. 14). 1073 North Benson Road, Fairfield, 203-254-4046. www.fairfield.edu/museum. Bring the kiddos to the Lyman Allyn Art Museum in New London. On Saturday afternoons from Nov. 24 to Dec. 15 the museum hosts family-friendly “Winter Circus Family Teas” — tea, a hot chocolate bar, and desserts in the on-site library. Kids might decorate cookies or make a snowstorm in a jar. Wander the new “Winter Circus” exhibit with works by Pablo Picasso, Walt Kuhn, and Lucien Clergue, and more. Regular admission: adults $12, students $5, under 12 free. 625 Williams St., New London, 860-443-2545. www.lymanallyn.org. The free-admission William Benton Museum of Art at the University of Connecticut houses some 6,500 works of art, from the 15th century to today, according to its website. Current exhibits include photographs documenting the role of young people in the Civil Rights movement (through Dec. 16) and “The Business of Bodies,” portraits by Ellen Emmet Rand (March 10). 245 Glenbrook Road, Storrs, 860-486-4520. www.benton.uconn.edu. Its streets lined with shops, galleries, boutiques, and eateries, the quaint old whaling village of Mystic has long been a Bostonian’s go-to day trip. If you did the aquarium last time, try the Mystic Museum of Art. By the banks of the Mystic River, the community art hub houses a permanent collection, rotating exhibits, and, through Dec. 22, a Holiday Gift Market. Shop sailor knot bracelets, ornaments, wine stoppers, pottery, handcrafted soaps, handcrafted jewelry, prints, and the like. Free admission. 9 Water St., Mystic, 860-536-7601. www.mysticmuseumofart.org. Lauren Daley can be reached at ldaley33@gmail.com. Follow her on Twitter @laurendaley1.